Order CORACIIFORMES: Rollers, Beeeaters, Kingfishers, etc. 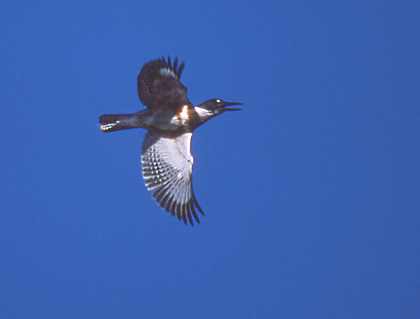 Belted Kingfishers are rather uncommon at Cedar Creek. A pair is frequently present on Fish Lake. Kingfishers have bred on or near the area. One wintered along Cedar Creek near 26 in 1986-7. A kingfisher has spent the winters of 1993-94, 94-95, and 95-96 on Cedar Creek near 26.